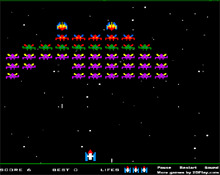 This game is very similar to Space Invaders but yet a bit different. Here you have no boulders to hide under. Very cool sound effects. A must for all Space Invaders fans!